Apart from being a satire on the legal process, the film is a brilliant depiction of the paradoxes of human self. Bizarre and absurd are the ways of law at times. 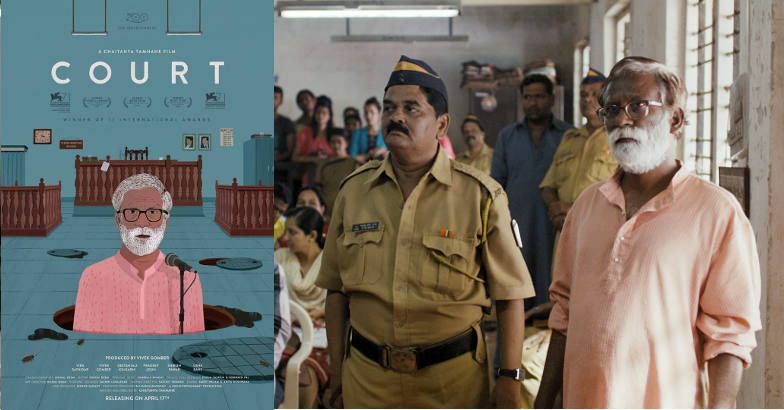 The Marathi movie 'Court'(2014), written and directed by Chaitanya Tamhane, is a tale of few lives caught up in a seemingly absurd web of legal procedure. The film has a Kafkaesque plot, bearing semblance to Franz Kafka's celebrated work 'The Trial', where the protagonist Josef K was put to an absurd and labyrinthine trial, without being told of the crime he committed. At the centre of action is Narayan Kamble(Vira Sathidar), a dalit-activist, poet and folk-singer in his sixties, who is facing a ludicrous trial for abetment of suicide. Kamble is prosecuted for writing a poem which evoked that death was better for sewer-cleaners and manual scavengers as their right to life was not recognised by the rulers. The mood of disillusionment in the poem made a worker commit suicide in a manhole, alleges the prosecution. Probably, the negligence of authorities in providing adequate safeguards to the worker led to his suffocation inside the sewer. But no one is interested in finding out. Instead, they get a poet, an easy target, to pin the liability. The possession of certain literary works by Narayan Kamble, which were banned during the British regime, is used as evidence to portray him as an anarchist and extremist. The charges may sound incredibly absurd; but such a trial is not totally implausible - we have been seeing people getting prosecuted for their poems, slogans, cartoons, and even facebook likes! Apart from being a satire on the perfunctory and absurdist ways of the legal process, the film is a brilliant depiction of the paradoxes of human self. The defence lawyer of Narayan Kamble, Vinay Vora(Vivek Gomber), hails from a rich and elite background. He puts in all sincere efforts to save Kamble, and fancies himself as a protector of human rights. While not arguing in courts, he gives talks on human rights before upper-class intellectual audiences, frequents plush pubs and restaurants, enjoys premium wines and jazz music, and sinks himself into mindless TV programmes at late night. A loner at heart addicted to luxuries of life, Vinay Vora gives out the impression of a person who is doing things to fill in the void of his inner life. Vora himself is a beneficiary of the skewed set of class privileges and social hierarchies, against which Kamble had fought through his writings and activism. At contrast is the lady prosecutor in the case, Nutan(Geetanjali Kulkarni), who goes about her job with a sort of nonchalance characteristic to a government employee. She is a struggling middle-class woman, who travels in second class local train compartments and worries about price rise of vegetables and oil. Unlike Vora, she is not dreamy about the idealistic notions of her profession. For her, its just a job which will fetch the monthly salary to keep her family stay afloat in the metropolis. As a person symbolising the struggle for survival, she is in a better position to identify and empathise with the ideals of Narayan Kamble. However, she is trapped within the confines of her humble life, and does not endeavour to look beyond its limited horizons. For her, the case of Narayan Kamble is yet another 'headache', which she wants to get done with it at the earliest by sending him to prison. The judge in this movie is the personification of apathy and indifference. Dehumanized by the system, he goes about his business mechanically, without opening his eyes, and without understanding the essence of law. (In a scene, he refuses to hear the case of a woman, as she was wearing a sleeveless blouse). Narayan Kamble gets ultimately acquitted for want of evidence. However, he is immediately brought before the same court on a different allegation that he committed 'sedition' by writing 'anti-national poems'. The Court was closing for long summer recess, and the judge, in his haste to wind up things fast, refuses to hear his bail plea, and with utmost apathy directs him to approach the High Court during vacation. What follows is a long still shot of the dark and empty court room, after the staff has switched off the lights and shut the doors. The darkness, stillness and the silence of the scene leave your mind numbed. On the surface, the film is a critical commentary on the insensitivity of legal system. Yet, a few philosophical insights glitter here and there, using the metaphor of court for the larger scheme of life. Its absurdist plot seems to signify the random, meaningless and nihilistic vicissitudes of life. We see a couple of characters, who sleep-walk through the life situations into which they were thrown without choice. Their lives are without essence. They have only their half-truths to fall back upon for consolation. The only one who could see through things to grasp the real truth was Narayan Kamble and he gets punished due to the ignorance and apathy of others. And the others make a prison for themselves with their half-baked lives, and wallow in self-pity and agony there. The film closes with the scenes of the judge indulging in vacation fun with his family. Without any prick of heart regarding the suffering caused to others due to his dereliction of duty, the judge enjoys himself in a beach resort. Clad in a tee-shirt and shorts,he sings to anthakshari games, gulps down liquor shots,gives unsolicited advise on numerology and gem stones and gets jealous about young IIM graduates getting lucrative jobs. Upon getting exhausted in his vacation revelry, the judge dozes off in a bench(bench! ), and a bunch of kids play a prank by screaming at him. The Judge wakes up from his slumber, with a stunned expression, and the film ends with that scene. Was it the director's call to the audience to wake up from the slumber of life, and to feel the essence of life and grasp the truth? Yes, the truth might stun us; but it will also liberate us. The brilliant film, portrays reality as it is without taking any artistic liberties, and turns our faces to a lot of inconvenient truths.